Everything vibrates. And everything in the body vibrates at its own special frequency. This is scientific fact. When we are thrown out of balance through physical, emotional or psychic shocks, our body and psyche can weaken or overload, creating distorted and unbalanced vibrations. The Chinese have known this for centuries, and the recognition of this is the basis for the traditional healing art of Acupuncture and Kinesiology. Through the pioneering work of auditory psychic Sharry Edwards, a very unique sound therapy system has developed. Low frequency sound waves are fed back to the body via the brain to re-mind the body what the original healthy frequency was. When the sound waves that you most need are played to you, they balance these peaks and troughs to bring the mind and body back to a harmonious state. In this state, healing can take place. Thus also the unique vibrational 12 frequencies of the spine were established. It was discovered that the notes & related colors along the spine remain the same for most people. The spine frequencies incorporate all the notes of Western music. If you could see them in color you would see a rainbow. These notes stretch over two and a half musical octaves, which, interestingly, is the average vocal range of a singer. Each part of the spine affects areas of the body and affects certain states of mind and emotion. The work of author Louise Hay also supports this, among others. For example, the neck and shoulders area ( C1 - C7) is associated with face, head, scalp, ears, pituitary gland, brain, eyes, sinuses, jaw, nose, mouth, eustachian tube, vocal cords, neck, throat, shoulders and elbows. Issues can be confusion, negative self -views, refusal to see, resentment, taking on too much, accepting blame, ridicule, resistance, feeling out of balance, difficulty in communication and so on. 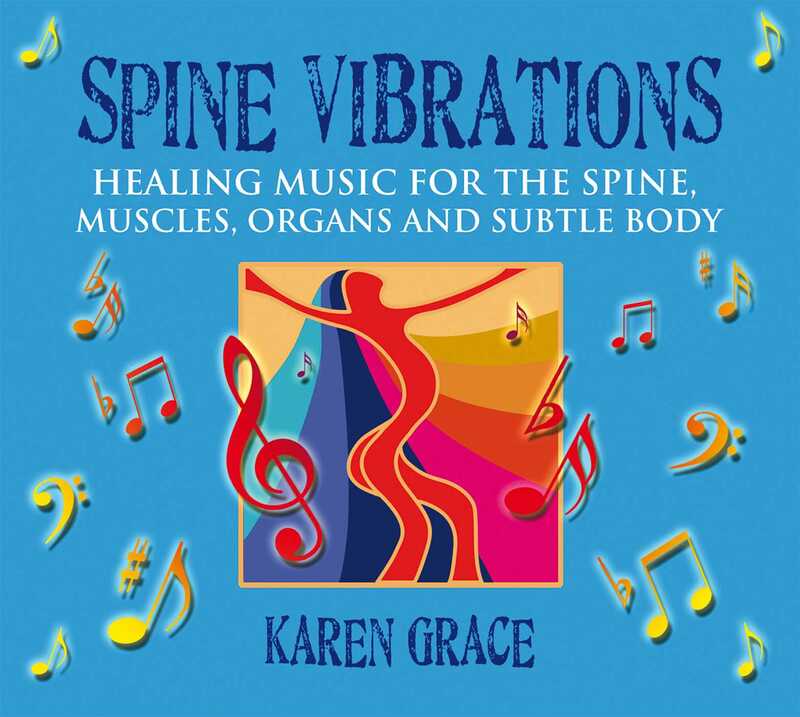 Spine Vibrations can be used for regeneration and as a general tonic for the nervous system by listening to it in its entirety. If you know the trouble spot e.g. neck and shoulders, or T5, you can listen repeatedly to one or several frequencies for this. (Listen with good quality headphones with a good bass response while you are resting or doing quiet activity.) You can also listen whilst reading or doing light work. It is advisable to first choose your sounds when you are lying down and paying attention. Choose your favorite tracks intuitively, and then look up the frequencies and compare them to the trouble areas you are aware of. This is usually a great exercise in trusting your intuition, because you will choose the right sounds for yourself. Trust what you are drawn to. Listening to the music as a chakra journey in meditation can offer an opportunity to go deeper into the messages and lessons of each energy center, and your instinctive liking for particular tracks a key to where you need to be working at any time. It is an opportunity for soul healing, relaxation and upliftment. For this it is not necessary to use headphones.